New research from Western University in Ontario suggests the universe’s first stars amassed in conglomerations so bright they shone with the power of a hundred million suns. 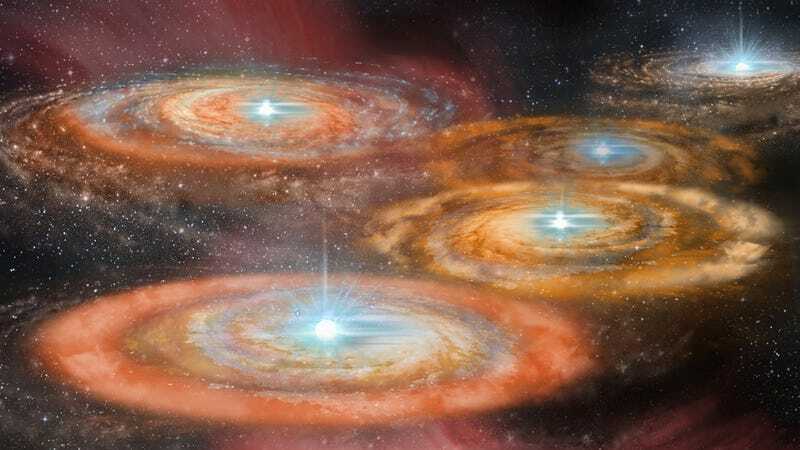 Above: An artist’s impression of some of the first stars in the early Universe. Five protostars are seen here forming in the centre of disks of gas. Caption and image credit: Shantanu Basu, University of Western Ontario. The study, conducted by Western’s Alexander DeSouza and Shantanu Basu, provides a glimpse of what the universe looked like shortly after the end of the cosmological period known as the cosmological “dark ages” — a time when atoms of hydrogen and helium were in existence but not yet shining in visible light. Their results now appear in a paper published in the Monthly Notices of the Royal Astronomical Society. The two scientists modelled how the luminosity of the stars would have changed as they formed from the gravitational collapse of disks of gas. The early evolution turns out to be chaotic, with clumps of material forming and spiralling into the centre of the disks, creating bursts of luminosity a hundred times brighter than average. These first stars would have been at their brightest when they were ‘protostars’, still forming and pulling in material. These young stars burned hot and died young. But they seeded the early universe with the first heavy elements, including life-fostering compounds like carbon and oxygen. As noted, this work was performed with models. Looking to the future, the scientists hope to use the next generation of space telescopes, including the James Webb Space Telescope, to acquire hard data in support of their conjecture. Read the entire study at Monthly Notices of the Astronomical Society: “The luminosity of Population III star clusters”.